I can’t remember where I saw the recommendation to read Cixin Liu’s The Three-Body Problem. 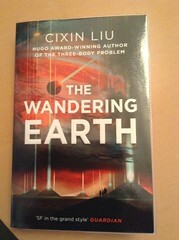 I still haven’t, but I did spot The Wandering Earth on my last flying visit to the Barbican Library, so I picked it up. First published in 2000, The Wandering Earth is an anthology of short stories, some of which have won China’s Galaxy Award. A couple of common themes stood out for me – alien first encounters and humankind’s need to leave the solar system. A lot of humour too.